With summers fast approaching, you’ll find it hard to keep kids away from the beach or pool. 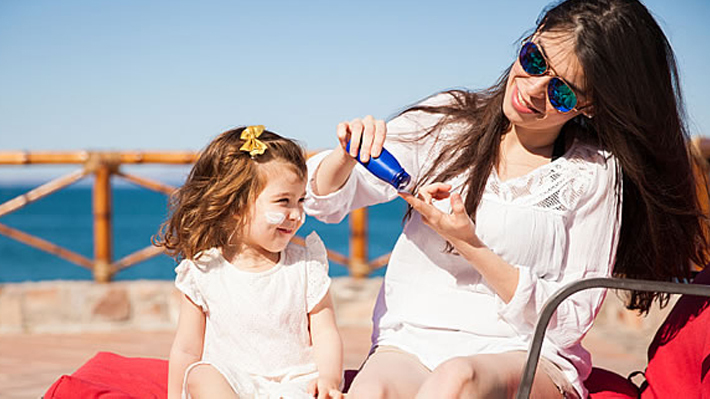 Here are a few tips to help you apply sunscreen the right way so that you kids stay safe in the sun and don’t miss out on any fun. Apply sunscreen 15-20 minutes before your kid plans to go out in the sun. Sunscreen takes a while to get absorbed in the skin and start acting as a defence against the sun. Carefully apply sunscreen all over the body. You might choose to buy special sunscreen for face and lips. You can choose amongst kids’ sunscreens especially designed for tender and delicate skin of little ones. You also get lip balms with SPF which can help protect lips in bright sun. If your kids are planning to go swimming, a water resistant sunscreen would be good. But you would need to consciously re-apply sunscreen every 2 hours or as mentioned in the instructions. Do apply sunscreen lavishly; the more, the better. Sunscreen will form a protective layer on your skin, so you wouldn't want the layer to be weak. Dermatologists suggest that you should apply at least 1 oz. of sunscreen in one go. You should choose swim wear with maximum coverage, especially for children. The less you are exposed to sun, the better it is. Wear other sun-protective gear to get full protection. There are goggles, sun hats, menthol powders and rash protectors. When sunscreen is rubbed on skin, it gets absorbed and works better. You should rub sunscreen lotion on skin till it gets absorbed and is no longer seen. Sunscreen sprays, on the other hand form a protective layer on skin. You will have to try and see which works best on your child’s skin. Like every medicinal product, do remember to check the expiry date on sunscreen.